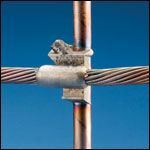 For through cable connections to the side of ground rods, there has never been a faster or easier way to make a reliable CADWELD® connection. The two-piece CADWELD GY mold lets you make connections in a trench in about half the time it would take with compression connections or other exothermic connections and at a fraction of the cost. 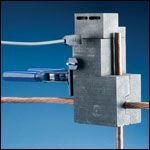 CADWELD GY molds are simple to use and provide for easy cable alignment. The molds include a baffle mold cover that reduces emissions and extends handle clamp life.